Royal College Union takes pride in being the oldest alumni society in Sri Lanka, and is poised to celebrate its 125th Anniversary this year. 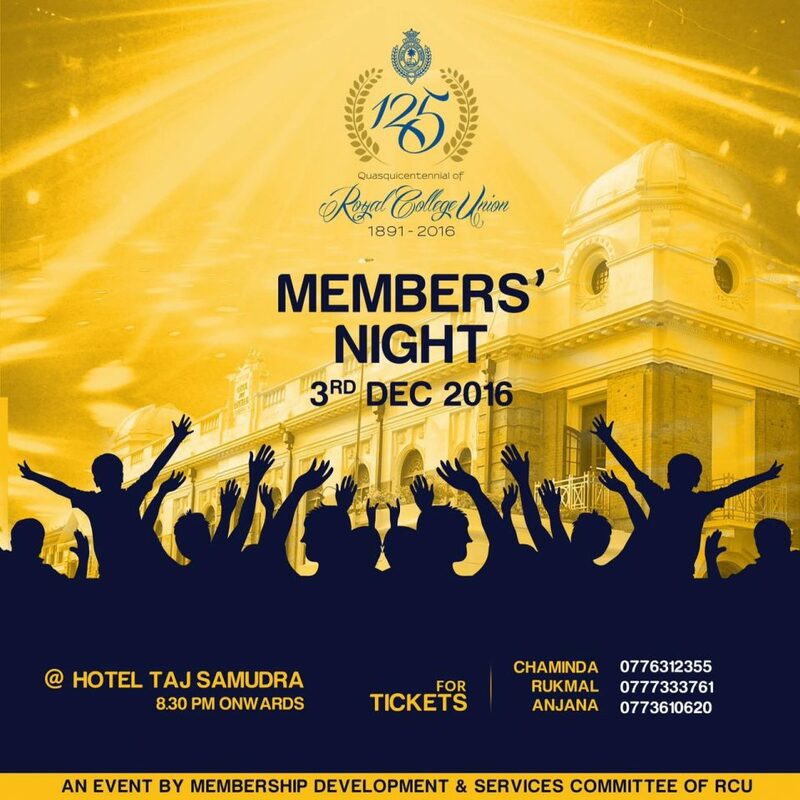 In conjunction with the 125th Anniversary celebrations of RCU, the “Royal College Union Members Night 2016” was successfully held on the 3rd of December 2016 at Taj Samudra Colombo – Grand Marquee (North Lawn). This time more than 350 participants representing various past Groups were joined for this special night. The night was more colourful with the music groups lead by Judy De Silva and Dushyantha Weeraman. Also Ronnie Leach and Marriazelle Goonathilake were joined as Guest Artists. A star class buffet dinner with special beverages and entertainment was organized along with raffle draws, entrance gifts, special offers, vouchers and many more exciting prizes which were given away to fellow members during the event. The event , “The Members Night 2016 ” was organized by the Membership Development & Services Committee of Royal College Union, and was set as one of the most spectacular event in the year of the RCU Calendar. The committee also extends its gratitude to the sponsors of the event this year. The Platinum Sponsor Auto Miraj, Official Radio Partners – Red FM and Sith FM, Official Photography partner -The Review Magazine, Official Clothing partner – Stripes & Check. Official Social Media partner – eDesigners and Official Online PR partner – Lanka Business News and Official Transport Partner – UBER.